Every transformer contains at least one parameter: the Transformer Name. Most transformers also have additional parameters that you can change to suit your workspace. The properties button on a transformer is color-coded to reflect the status of its parameters. A blue properties button (or one that matches the color of its transformer) indicates that the default transformer parameters have been checked and amended as required, and the transformer is ready to use. A yellow properties button indicates that the default parameters have not yet been checked. You can use a transformer that is in this state, but the workspace results may be unpredictable. Click the Properties button to the top right of each transformer to open a dialog. This dialog contains defaults that Workbench initially sets for the transformer. On the menu, select View > Windows > Parameter Editor. The Parameter Editor pane opens. This pane displays the parameters of any transformer that is currently selected on the canvas. Advanced transformer parameters are integrated in most transformer dialogs, so that the options can be easily configured with other elements in the workspace. Click the menu button to access these parameters. Advanced parameters can be set, changed, published or unpublished, set to an attribute value, or linked to another parameter. Additional functions, such as an advanced editor and an arithmetic editor, are also available in some transformers. 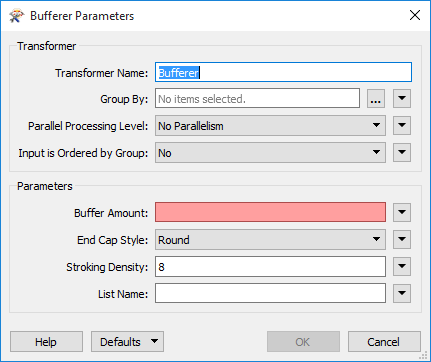 Note: In many cases, you can use the default transformer parameters without having to access the transformer parameter menu. If you frequently work with the same transformer, you can create and reuse the same sets of parameter values. For more information, see Parameter Presets.